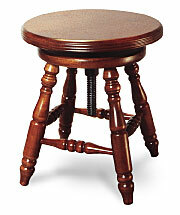 Adjustable Piano Stool is rated 4.00 out of 5 based on 14 ratings. Satin Finish or High Polish? The Classic Piano Stool made in Wisconsin by Paul Jansen and Sons. Fingertip rotation allows you to adjust the height of these stools. Wood Top Adjusts from 16" - 23"
Padded Top Adjusts from 18" - 25"